When Justin Thornton ’07 decided to propose marriage to Jennifer Castillo ’09, JD’12, he wanted to do so on the Heights, where the pair had their first date—a visit to the Labyrinth on Burns Lawn—in her freshman year. Both now live and work in Washington, D.C. He, a finance major, is in real estate development; she, an international studies major (and the Romero Scholar in 2008), is an attorney at an education-focused law firm. 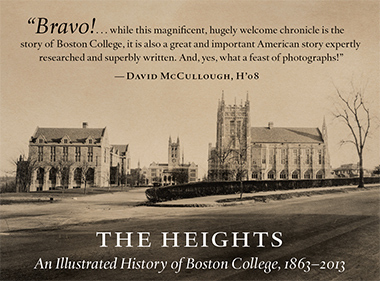 Thornton’s co-conspirators included Castillo’s mother, her sister, Alba, who was a high school senior, and John Mahoney Jr. ’79, director of the Office of Undergraduate Admission. Mahoney provided the pretext for the visit to campus by arranging a special “prospective student” tour for Alba. The guide would be Jane Croke ’14, a member of the admission staff, in on the plot. On April 4, the unsuspecting Castillo flew to Boston to accompany her sister and mother. Thornton begged off, claiming a business obligation. When Castillo rounded the northeast corner of Gasson Hall and saw him, she was at first irked: He was interrupting Alba’s special day. Persuading Castillo that the tour was a set-up took a minute, after which Thornton made his proposal (“short and simple; I didn’t want to blow it”). Friends and family on both sides emerged from Gasson to offer congratulations.